Eight hundred second-hand computers are on their way from the UK to Ghana as part of a man's charity drive to help schoolchildren in his homeland. Jib Hagan, 52, from Worthing in West Sussex, is overseeing the shipping of the PCs, monitors and printers to 20 chosen schools in the African country. His operation - CARE Computers for Developing Countries - includes a service and distribution base in Ghana. Mr Hagan and his daughter will spend four weeks there in February and March. It was Phoebe Hagan, 11, who inspired her father's mission because she could not communicate by e-mail with relatives and friends in Ghana. Mr Hagan has spent the past four years collecting unwanted computers from schools, businesses and homes, and the first two containers of equipment began their journey on Monday. He is putting more than £10,000 of his own money into the project, and that amount was matched by his employer BOC Edwards for the shipping costs. The computers are due to arrive at the port of Tema in Ghana on 15 February, and Mr Hagan will then start the process of getting them into the 20 schools. "Each school will have 20 PCs to set up an ICT [Information and Communications Technology] club," he said. 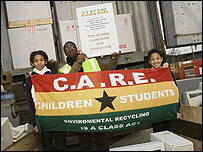 Mr Hagan also wants to raise awareness among schoolchildren of recycling issues. By giving them second-hand computers, his aim is to "encourage a new generation of people in Ghana to become eco-warriors". "I want them to learn more about environmental and recycling issues in class so we can all protect our planet and natural resources," Mr Hagan said. He has nearly 1,000 more donated computers awaiting shipment to Ghana.